Jon and I have been itching for a getaway for months and we were finally able to do a mini getaway on the President’s Day long weekend. We left after work on Thursday, and stayed the night in Yakima at the Ledgestone Hotel, which is a hotel that we have stayed at before. The Ledgestone markets itself towards the extended stay traveler, but are more than happy to accommodate the overnight guest as well. It is modern and clean, with a kitchen with a stove top, refrigerator, and dishwasher. Plus, the best part is that they offer Tarocco products as their toiletries – the absolute best toiletries I have ever found in a hotel. They are made with Sicilian red orange, also known as blood orange, and they smell great and work even better. I had forgotten that the Ledgestone uses the Tarocco line, so that was pretty exciting! I know, I’m easy to please. After reaching Yakima Thursday evening, we got a quick and easy meal across from the hotel at Bob’s Burger’s and Brew. Bob’s isn’t someplace we go when we are at home, but hey, it was easy. I had a turkey, ranch and swiss sandwich that was pretty decent, and Jon really liked the mandarin orange and feta salad. Then we pooped out and watched a bit of TV until we reached total exhaustion. Friday morning, we slept in. I woke up for the first time at 6:20 am, and promptly went back to sleep until 8. I fought waking for 20 minutes or so, and then got up about 8:30 and ate breakfast. 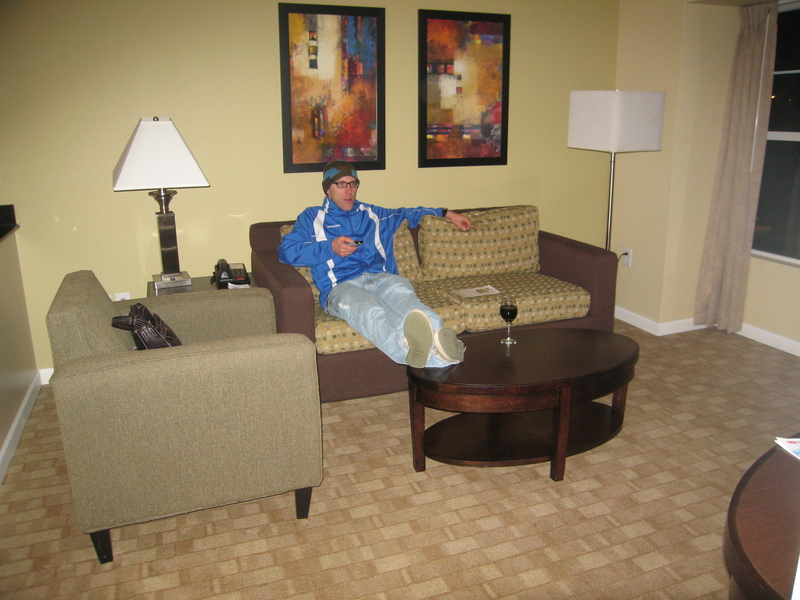 After puttering around for a little while, Jon went out for a run and I checked out the Ledgestone’s fitness room. I got to indulge a guilty pleasure for 45 minutes, watching Millionaire Matchmaker while I worked out on the treadmill. We headed out from Yakima about 11 am, and headed south in a light rain towards Goldendale. 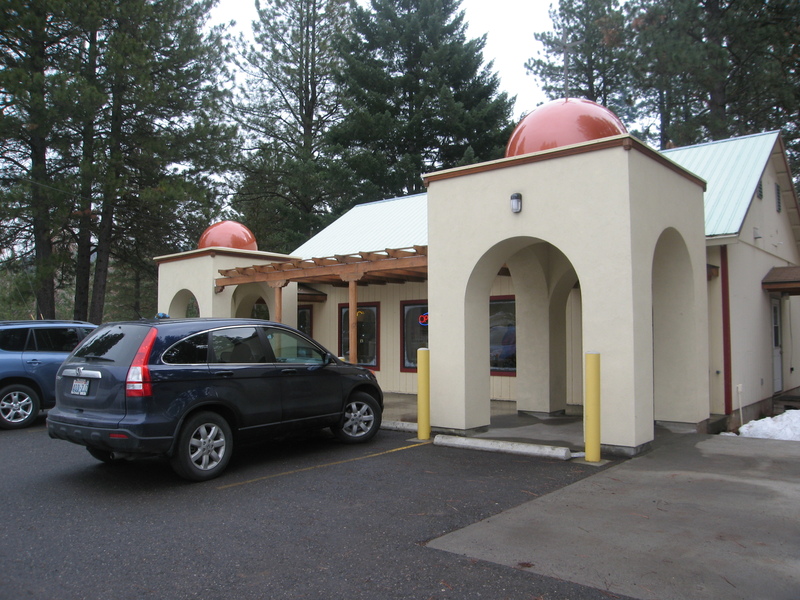 I read about a Monastery on Highway 97 on the way to Goldendale, where a group of nuns operate a no frills Greek restaurant, bakery and gift shop in front of the St. John’s Monastery. St. John’s Monastery is a Greek Orthodox Monastery which houses 20 nuns and novices (apparently in the Greek Orthodox faith it isn’t called a convent). The monastery is supported entirely by donations and the sale of the food, handiwork and crafts that are sold from the restaurant and gift shop. When you look at their website (it does seem strange that monasteries have websites), you see how hardworking these nuns are – helping to build the monastery by hanging drywall, installing insulation and hanging windows! We both ordered Gyros, and Jon had an Americano with his. The Gyros were heavenly, with a delicious buttery pita, and an excellent tsatziki. It might have been the best Gyro I have ever had, and for only $5.29! While we waited for our lunch, we looked around the giftshop. The nuns make a wide variety of items, from homemade soaps, lotions, cards, and sweets. They also carry commercially made religious icons, crosses, and some other gift items. I purchased some lotion, soap and a card for my Grandma. We got back on the road and headed into Goldendale. First on our itinerary was Waving Tree Winery. 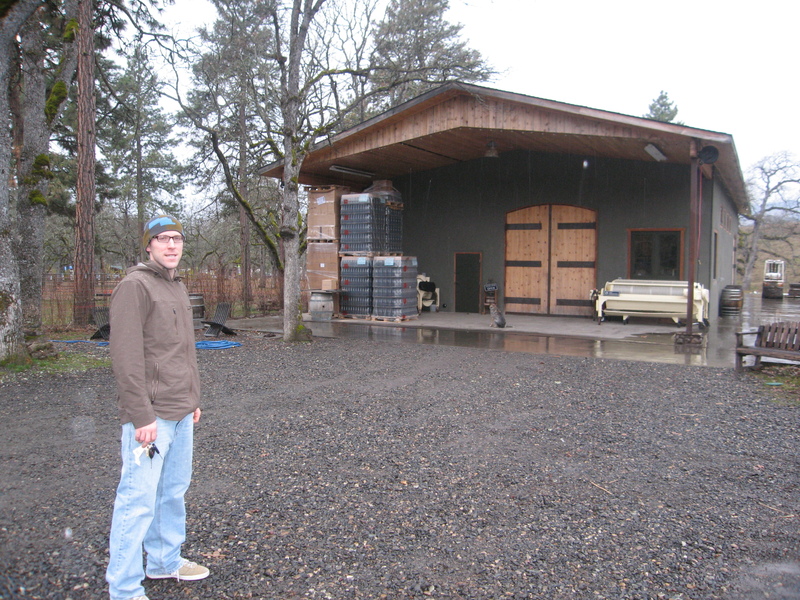 We first visited Waving Tree in 2010 on a trip to Goldendale, and were impressed at the first taste. And this visit didn’t disappoint. It is rare for a winery that does a such a wide variety of wines to be able to do them all so well, but Waving Tree does. We spent over an hour there, tasting wine and chatting, and were pleasantly surprised to find out that Waving Tree will be opening a second tasting room in Kirkland in March. Although it is great to be able to go right to the source, Kirkland will be much more convenient. We will be able to visit more than once every two years! 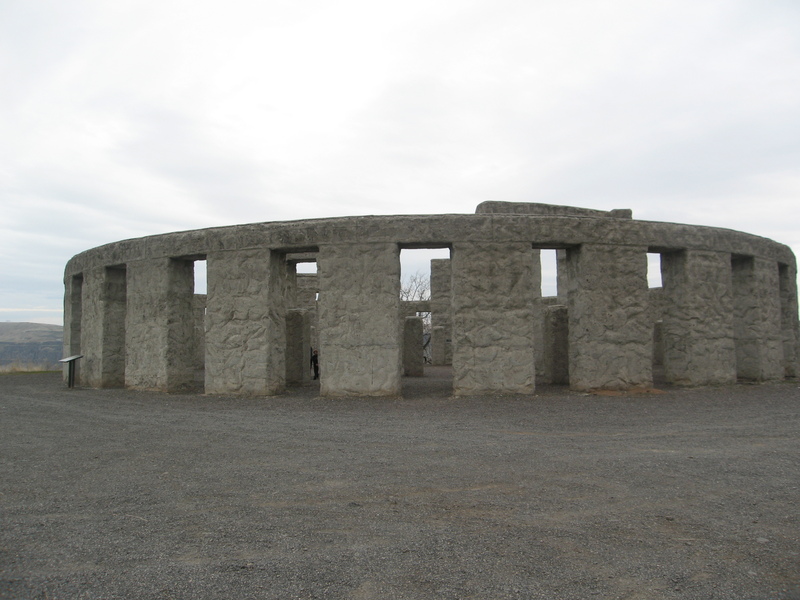 Goldendale’s Stonehenge replica is just down the road from Waving Tree, so we stopped there for a few minutes and snapped some photos. It was completed in 1930 – funded by Sam Hill, whose mansion on the bluff is now the Maryhill Museum of Art. It is a memorial to those who died in World War I. After leaving Stonehenge, we stayed on the Washington side of the Gorge, and headed about 25 miles down Highway 14 to Lyle. The basalt cliffs on either side of the highway are beautiful – I just wish it hadn’t been pouring down rain so I could have gotten some photos. We had a purpose though; we were on our way to Syncline Wine Cellars. We had never been there before, but had tried one of their wines once when we picked it up at a wine shop in Seattle. Jon remembered that – I didn’t – although I thought it was a very good wine when he reminded me. So when he was trying to decide which new wineries we should visit, Syncline made it on the list. Syncline is no frills, with their tasting room in the front half of their barrel storage and production facility. Our server was friendly but not particularly talkative or outgoing. Our tasting was 6 wines, Roussanne, Viognier, Rose, Carignan/Grenache, Mourvedre, and a Counoise. The Roussanne was probably the best single varietal Roussanne I have had, but I think I’m just not a big fan of Roussanne. The Rose was a pleasing dry Rose – I bought a bottle and am looking forward to enjoying it on our deck once the weather turns warm. Of the three reds we tried, we liked them all, and it was tough to pick a winner. But, we both liked the Carignan/Grenache best, so we left with it. On the way out, I threw a tennis ball for the winery dog, an Australian Shepherd who had been waiting patiently for us to re-emerge after our tasting. It was still raining when we left and headed across the Hood River toll bridge to Hood River. But I’ll save Hood River for the next post! This has been a long week. Jon and I took a President’s Day weekend trip and arrived home on Monday evening (multi-part blog post coming soon – I promise!) My boss is on vacation (a very over-due vacation), so I’ve been in charge this week, and as a result work has been a bit more busy than usual, and then we had some other stuff going on too. So this weekend has been a well-deserved break. On Friday night, I opened a bottle of 2010 Matthews Estate Sauvignon Blanc. 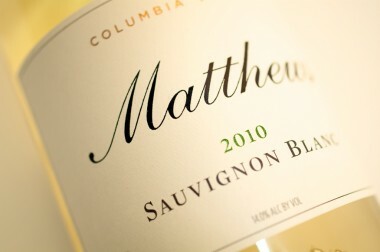 We purchased this bottle during a trip down to Woodinville last year, and I think that Matthews does a great job with their Sauvignon Blanc. It is actually blended with 6% Semillon, so it isn’t 100% Sauvignon Blanc, but you would never know it from the taste. This is a crisp wine, with a light acidity and minerality, and hint of floral taste. It went well with the cheap pork roast and hominy that I quickly cooked last night, but I imagine I’d have been happy pairing it with any type of food. Jon and I finished the bottle off tonight (Saturday), and it went nicely with today’s shrimp tacos too! After my one glass of remaining Sauvignon Blanc, I wanted something more this evening, so I opened a bottle of Italian Prosecco Spumante by Villa Carlotti. I had never had an Italian sparkling wine before, and this bottle was a gift from my former boss after we settled a union contract last year. As I hadn’t tried it before, I did a little research, so here’s your wine education for the day. Prosecco is the grape – apparently also called Glera… I’ll be honest, I hadn’t heard of either. Spumante is the Italian word for the full-sparkling type of production. There is also a semi-sparkling method of production called frizzante. Weirdly, you can also buy inexpensive frizzantes in cans in Italy (that just seems wrong to me, but hey, what do I know?) Due to the fact that Prosecco is secondary-aged in stainless tanks, this makes it much less expensive than its French sparkling cousin – Champagne. Prosecco is also the typical ingredient in a Bellini, if you are partial to those. At any rate, the Villa Carlotti Prosecco Spumante is a very dry sparkling wine with a light taste of pear, and a hint of Golden Delicious apple. Based on internet prices, it seems this wine is fairly inexpensive… between $7 and $11 a bottle, so it would be a great everyday drinking wine. Could be perfect for Mimosas on a Sunday morning! Or Bellinis! I should google the recipe…. I have long pondered the idea of using this blog to do some book reviews too. I’m a voracious reader, even if I often find myself wishing I had a lot more time to read. A lot of the books I read fit with this blog’s history theme, if not the wine theme. Although, now and again, I read a book that artfully combines wine and history! 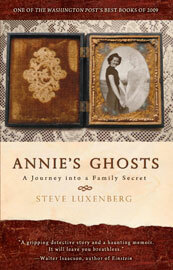 My mom bought Annie’s Ghosts because she has an interest in genealogy, and because she also grew up in and near Detroit, Michigan, where the story takes place. It is a non-fiction book by Steve Luxenberg, who is an editor at the Washington Post. Steve expertly tells the story about his experience, finding out shortly before his mother’s death that she had a sister who her children never knew about. The family made the decision to let the sleeping dog lie while their mother was alive, but after her death, he decided that he needed to find out the real story of his aunt. He details his search, beginning with the discovery that his aunt, Annie, had been committed to Eloise, a mental institution in Detroit, in the early 1940s when she was just shy of her 21st birthday. For reasons unknown, what was supposed to be a temporary commitment lasted for over 30 years, until Annie’s death in 1972. Steve’s search for information about the commitment, Annie’s mental illness and physical handicap, and who in his family knew what leads the readers through a series of twists and turns. The story sheds a lot of light on the difficulties of the search for genealogical information, public records, medical records, as well as the challenge of finding a living family member or friend who remembers anything and is willing to talk about subjects that were at the time taboo and a source of family embarrassment. The story is very well written, and Steve Luxenberg does a great job of tying together information that he discovered in bits and pieces over the course of several years. He is candid and open about discussing the shortcomings of his mother, who hid her sister from everyone closest to her, trying to understand the motivations of a woman who took her secret to the grave, while not being judgmental. He is honest about the fact that sometimes we can’t understand the influence of a different time in history. Secondary to the search for Annie, but no less interesting, Steve shares with the reader what he has learned about the rise and fall of mental institutions in the United States. He provides a history of the first asylums that rose out of the county poorhouse model, to the heyday in the mid 20th century of housing the mentally ill to keep them away from the general population. He also discusses the shifting societal views that led to the emptying and closing of a large number of institutions across the country, beginning in the 1970s. Annie’s Ghosts candidly discusses the stigma of having a family member who was mentally ill, and the challenges that home care posed in an era before effective medications had been developed for treating many mental illnesses. Overwhelmed family members were often relieved to have someone taken off their hands. But he doesn’t try to excuse or explain away society’s willingness to let millions of Americans rot away in overcrowded asylums with inadequate care. Interestingly, he does touch on the powers of television to medicate patients where care providers had very few options for settling or soothing an agitated patient. In the end, I ended up wishing that he had found more answers about why Annie was institutionalized, and why his mother kept her hidden for the rest of her life, but perhaps that is expecting something unrealistic. Although he never expresses it bluntly, the reader feels his regret at not asking his mother before she died about Annie. It is a message for all of us that we need to be more open about sharing our secrets with those closest to us. Sometimes easier said than done. Troon Dry Riesling: Some Apple with my Brisket! Today was a lazy Sunday. I stayed up late with friends last night, way past my usual bedtime, and for some reason I wasn’t able to sleep past 7:30 this morning. So I had a relaxing, lazy morning, and cut up some veggies and threw them in the crock-pot with a corned beef brisket. When Jon left to go workout – I took an awesome nap! It was heavenly – Martini and I snuggled in, and couldn’t wake up when our alarm went off, so we turned it off and went back to sleep! It has been awhile since I’ve had a great nap like that, and I thoroughly enjoyed it. After I got up from my nap, Jon and I went for a long walk and had some tea. When we got home, we just kicked back and waited for our brisket to finish up. 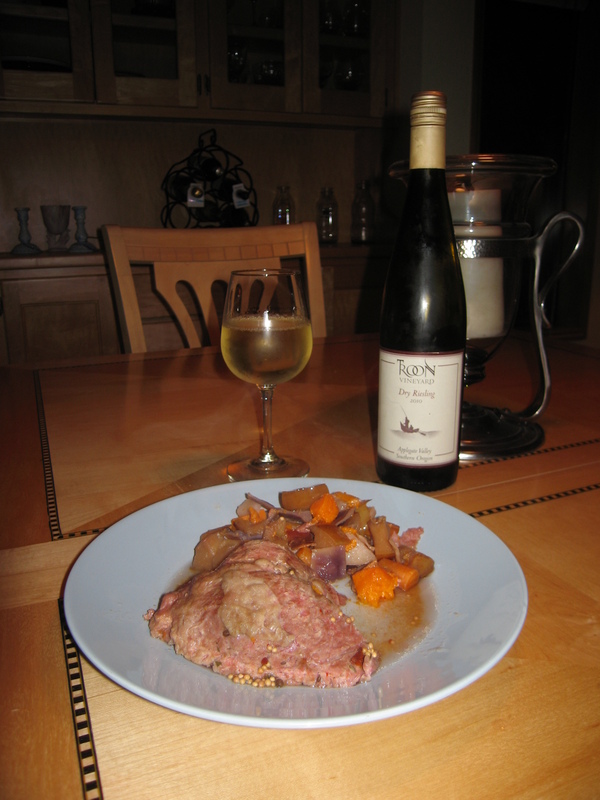 I opened up a bottle of the 2010 Troon Dry Riesling that we had tasted on our Southern Oregon trip in August 2011. Troon is one of the older vineyards in Oregon, opening in 1972. They have their vineyard in the Applegate Valley and another in Carlton, and they mostly make small lots. They use a minimalist style of wine-making, preferring to let the natural flavors in the wine shine through. This Dry Riesling tastes exactly like a Golden Delicious apple, with just the right touch of sweetness. It has a nice yellow color and a tartness at first sip which lingers while slowly softening on the palate. It complemented our brisket nicely, offsetting the salty flavor of the corned beef. I imagine this wine would also go well with a salty brie or blue cheese, and certainly dark chocolate! I will definitely pick this one up again! There is nothing quite like an upcoming vacation to lift the spirits. Jon and I have not been out of town on a vacation for us since August, and it has been weighing heavily on our souls. Of course, we were incredibly busy for a period of time, selling and buying houses and moving, but now that things have settled down we have both been itching to get out of Dodge. So the stars finally aligned and Jon and I are getting away soon on a road trip. We booked hotels! It was incredible, this feeling of having days off on the books. We were practically giddy! It does leave us with some work to do to decide what sights we want to see. We will want to do some wine tasting, but other than that, we haven’t decided. Of course, being winter in the Northwest, it will likely be raining during our trip, but we can’t let that stop our fun! The other certainty is that I will be taking a lot of photographs. When my computer crashed last summer, I lost a lot of my photos, and I’m eager to start replacing them! It’s kind of funny, because I love taking photographs, and I love sharing them with others and looking back on them later. But I’m as guilty as anyone of not always pulling my camera out as often as I should, I suppose for fear of looking too touristy. I have been roaming around with a small purse lately, but I think I’m going to switch back to a larger purse that I can easily fit my camera in. So, today is itinerary planning day. At least get some sort of idea of how far things are from each other, so we know what we might be able to fit into each day. We will use that as a guide, but what is a vacation if you can’t deviate from the plan too? Yippee!